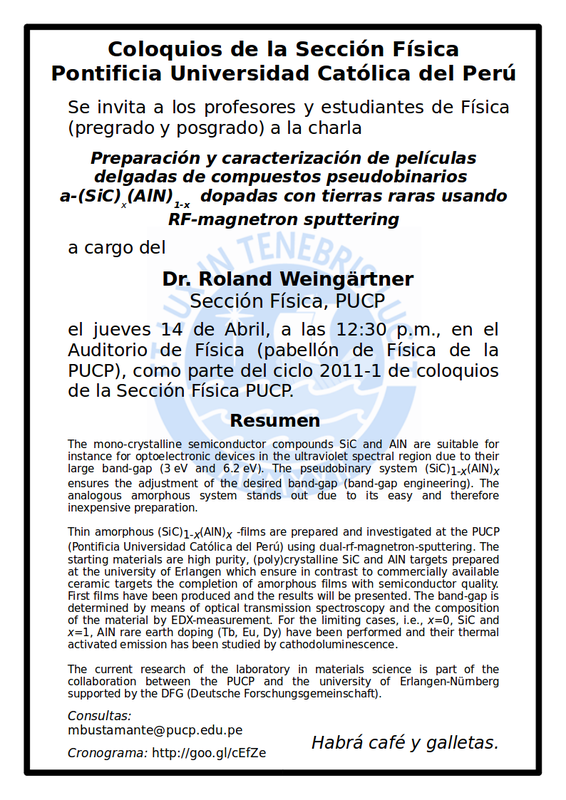 Ponente: Roland Weingärtner (Sección Física PUCP) The mono-crystalline semiconductor compounds SiC and AlN are suitable for instance for optoelectronic devices in the ultraviolet spectral region due to their large band-gap (3 eV and 6.2 eV). The pseudobinary system (SiC)1-x(AlN)x ensures the adjustment of the desired band-gap (band-gap engineering). The analogous amorphous system stands out due to its easy and therefore inexpensive preparation. Thin amorphous (SiC)1-x(AlN)x -films are prepared and investigated at the PUCP (Pontificia Universidad Católica del Perú) using dual-rf-magnetron-sputtering. The starting materials are high purity, (poly)crystalline SiC and AlN targets prepared at the university of Erlangen which ensure in contrast to commercially available ceramic targets the completion of amorphous films with semiconductor quality. First films have been produced and the results will be presented. The band-gap is determined by means of optical transmission spectroscopy and the composition of the material by EDX-measurement. For the limiting cases, i.e., x=0, SiC and x=1, AlN rare earth doping (Tb, Eu, Dy) have been performed and their thermal activated emission has been studied by cathodoluminescence. The current research of the laboratory in materials science is part of the collaboration between the PUCP and the university of Erlangen-Nürnberg supported by the DFG (Deutsche Forschungsgemeinschaft).